" This way, daddy! " Did you enjoy Dear Esther? Did you find yourself going "Hmmm, who MADE Dear Esther? Oh, The Chinese Room? What else have they made? A Machine for Pigs? I'll check it out!" If you found yourself in this category, you should enjoy Amnesia: A Machine For Pigs. I enjoyed Dear Esther, I just wasn't expecting a sequel to it so soon! The trailers for Dear Esther gave me the appropriate expectation, and the game delivered. In Machine, many players will have played the prequel, The Dark Descent, or have certain expectations from the trailer. You might do a double-take to be sure this is really the sequel. Yet it is. This is the evolution from Descent to Machine. Damn near every gameplay element from Descent was stripped in lieu of bumping up the visuals and telling a more direct story. A more traditional approach would have been to take what was in the first game, and expand upon the gameplay possibilities. This stripping approach, however, made Machine more accessible to a larger crowd, while simultaneously watering down any existent puzzle sections. A Machine For Pigs is largely a linear experience with very little exploration. There are a couple of sections where this formula is broken, and a dead end is offered or multiple objectives let the player choose in which order to complete the task. This was an excellent choice to let the player get their bearings and handle on the control scheme while jointly giving the player agency to where they want to go. The way in which the level makes you to learn this mechanic to continue is appropriate and natural, which is great. The problem comes that this mechanic of moving physics objects is almost never used again throughout the game. This in effect boils down to weak design on the developer's end. Why learn something you don't need to know how to do? "It's not a survival horror game. It is a narrative-focused Knott's Scary Farm maze. It's only scary at first, but after a few hours you realize that it is all a carefully maintained ride." 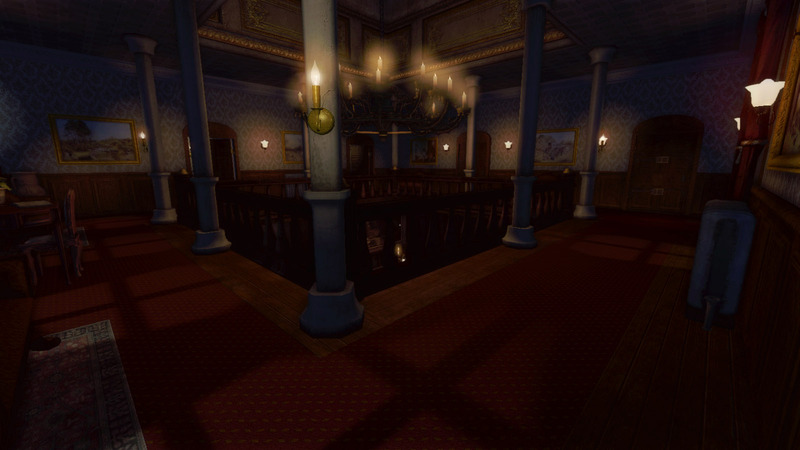 While that is not completely true as there are eventually enemies to avoid, the hallway pictured above is not a unique moment in the game by any means. The places you navigate are chock-full of locked doors at every turn, leaving you one place to go. The game has you walking a very linear path that has sharp soundbyte attacks plunked here and there for the jump-scare effect. When developing, and especially with a small team, it is important to keep the scope of your project in check. You can't expect every door to be open and promise endless explorable areas. There are ways to lead the player to the intended destination that do not make the player feel hand-held through forced navigation. 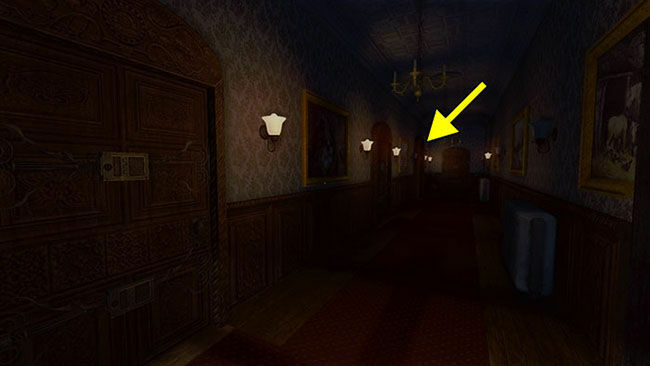 One of the doors could be an additional connecting hallway, or cracked open just a bit to peek inside. Another possibility is of course just remove one or two of them. I've seen half a dozen playthroughs of this game, and every participant tried to open all of the doors. It is hard not to feel deflated when every one of them is locked. 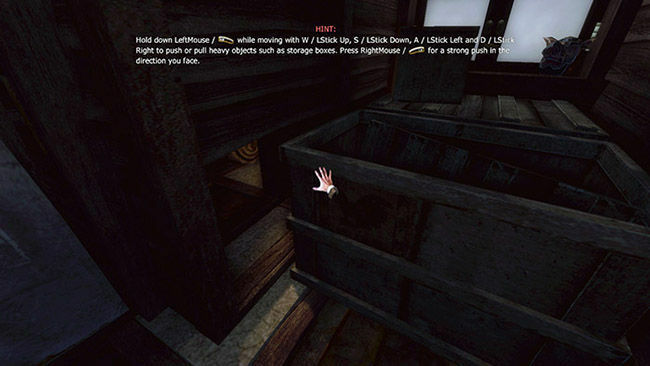 There was a part where the player is required to go retrieve a liquid solution, and on the return trip with the newly acquired item, the level layout had changed. I found myself wondering "what the heck, I don't remember this..." Upon further inspection and playing through again, the wall at some point closes behind the player, and a previously locked doorway is now open. It was a subtle mindbending moment that kept me on my toes. The very first encounter with a man-pig was essentially broken. I didn't know anybody or anything was coming. I had jumped up on a box to see if I could sneak behind it, and BOOM, the lights flickered, and the enemy was trying to attack me from the ground. It couldn't get to me though. I just sat on the box looking at it going in circles trying to attack me, never leaving. This is just a case of not enough playtesting to see that this could happen and break the experience of the moment. A simple blocking volume or larger crate would have done the trick. I would have been proud to have worked on Amnesia: A Machine For Pigs. The game has a clear vision. While the cinematic linearity could have allowed for a bit more player agency, the design was intentional and effective. The game has a spectacular finish that makes the misfires in polish along the way worth it.